This is an internationally known drink : In France vermouth, in Germany wemut, here vermouth or vermouth. It can be sweet and red like in Italy or dry and white like in France. Its secret is to mix wine and wormwood to give it a slightly bitter taste and a very particular aroma that arouses the appetite. That is why it is taken before lunch and has become synonymous with appetizers. It is not uncommon to hear the question: are we ready for the vermouth? or the call to friends: We wait for you to have a the vermouth. 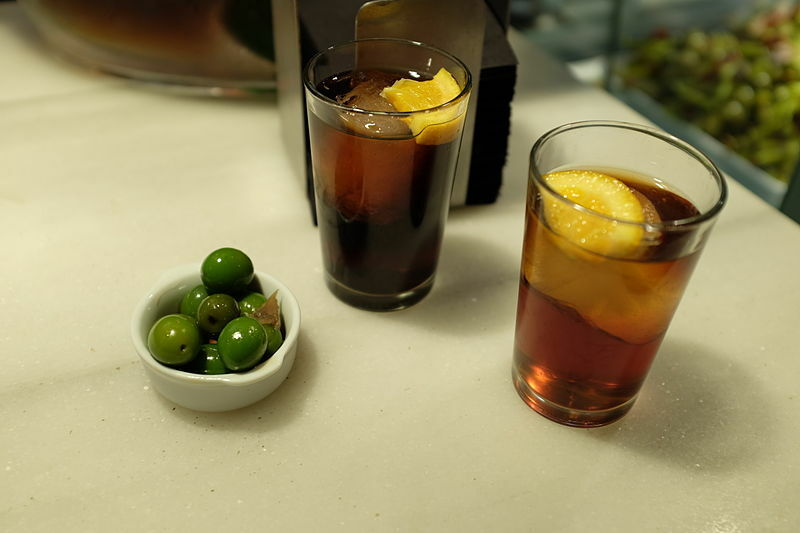 In Catalonia, the vermouth, has been a popular drink for a long time, both in towns and cities. But we must admit that lately it has become very, very fashionable. Especially in Barcelona, ​​today, if you are modern and follow the trends do not open a bar, open a vermutería. And take the opportunity to serve traditional tapas: patatas bravas or boquerones in vinegar are the most traditonals. You can also be sophisticated and offer delicacies. We are open to try everything. We are going to talk about only a few venues (on another occasion we will expand to more places and more neighborhoods). 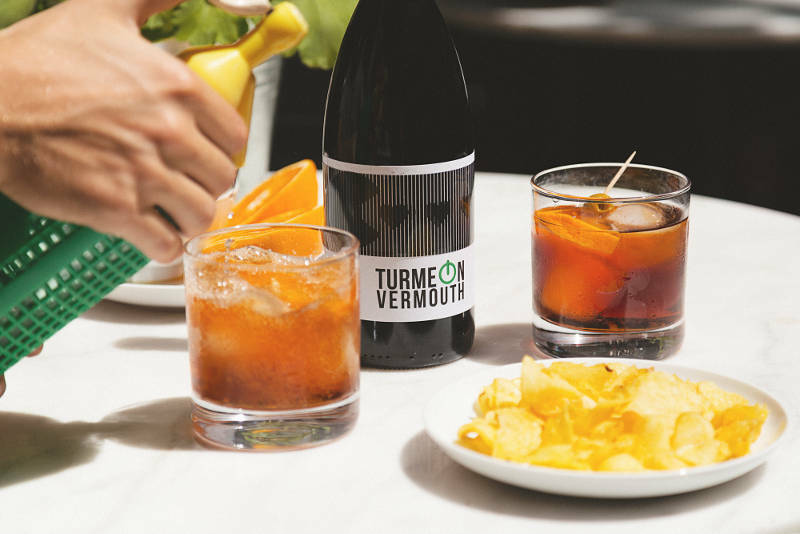 But before we start, just tell you that, in our opinion, it can be said that the creators of the Morro Fi vermouth brand were the pioneers of this revival of vermouth consumption. This popular drink served in his small glass, with or without ice, with or without olive, was reborn from his legend in this small bar on Consell de Cent Street. Now they have more stores, their own brand and stands at the coolest events in the city. There are always those who mark the path, in this case … who fills the glass first. We started in the neighborhood of Sants with a classic of the early twentieth century, the Bodega de Cal Pep, very close to a market (a detail that is already a guarantee that the tapas are going to be good): some fried fish, peppers stuffed with anchovies and a caloric bomb under the shape of a melted cheese called Torta del Casar. We go to Poble Sec to enjoy the Bar Seco and the Quimet i Quimet. The Bar Seco is famous for its terrace on the slopes of Montjuïc and for its commitment to oganic food (they announce they have their own garden) which is not very common in vermuterías. 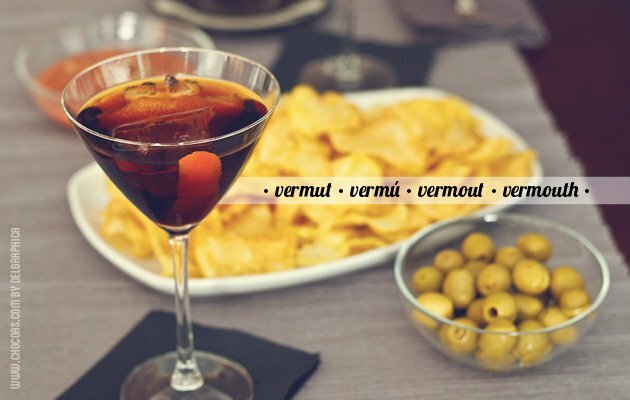 Good vermouth and slow food … ideal for Barcelonina people. Without moving from the neighborhood, we go to Quimet i Quimet. The first time I went I remember having eaten all the tapas and drank their tap vermouth (variety of the bottle that is served as if it were a beer) to finish singing (not drunk: “drink with moderation, it’s your responsibility” ) but for the satisfaction that there are such authentic venues. Everything is delicious and the vermouth excellent not to mention the cava. As you know, in Barcelonina we are specialists in the Sagrada Familia of Gaudí and its interesting neighborhood. A very unknown neighborhood despite the fact that so many tourists get there. Maybe because the traveler has to get lost in the surroundings of the temple and discover them without stress. For this two VIP proposals: Les Sagrades Tanines and Casa Mairol. Les Sagrades Tanines hides in a small passage at the foot of Gaudí’s work and recovers a huge space that used to be a place destined for public baths. They propose and excellent vermouth, croquettes, assorted tapas to be tasted while chatting sorrounded by an art exhibition. On Sundays, you can enjoy the best alternative music of the city: pop, rumba, African … pure wordl music. A few streets away, the Casa Mariol Wine Bar (a mixture of tradition and modernity) offers wines, vermouth and food from one of the most picturesque and unknown towns of Tarragona: Batea. Wines and vermouths on tap, traditional drinks such as “suau” (coffee and soda) and typical dishes of the Tarragona countryside such as “clotxa” or “coca de recapte”: vegetables and sardines. Without hesitation: you have to go to Bar Chiqui. A wonderful and authentic corner in the new hipster district of the city. Here time has stopped and it seems that neither the owners nor the parishioners (our very word to designate the clients of a bar as if they were faithful of a religious parish) care that the San Antoni neighborhood is now really trendy. A sandwich of tuna with its beer, its wine drink in a porrón (a « tool » to consume the wine used in Catalonia) and its vermouth alternate with the café con leche and breakfast bun. One of the oldest wine shops in the neighborhood, Celler Florida, has been converted into a tapas and vermouth venue, an exhibition venue and, when the municipal authority allows it, a venue for good rock and roll performances. We finish (for now) in the neighborhood of Clot and Sant Martí visiting two very unique premises: the Bar Sidral and El Taller del Clot. Bar Sidral can boast of an excellent clientele mix of intellectuality and family audience to whom Nuria deals with good conversation and with their specialties of anchovies and other delicious specialities. Behind the wall where the old refrigerators with wooden doors are boxed, we might find surprises that we will only know if we visit the place. In Taller del Clot what is hidden, in addition to a gastronomic-cultural category, is a courtyard at the back of the premises that will delight vermouth consumers. 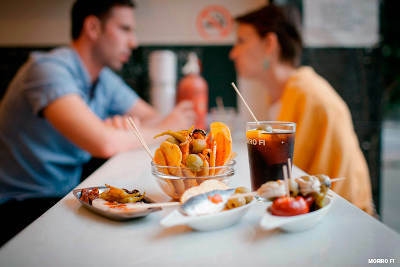 Chiringuitos, taverns, bars … I hope you will take the time to discover this urban ritual and you will enjoy with Barcelonina a tour of the city with excellent tapas and the best vermouths.